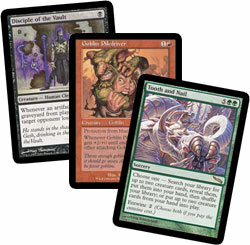 On June 1st, the DCI issued an announcement that the Darksteel card Skullclamp is banned in the Standard and Mirrodin Block Constructed formats effective June 20, 2004. What this means is that you may no longer use that card in decks for events of those two formats. 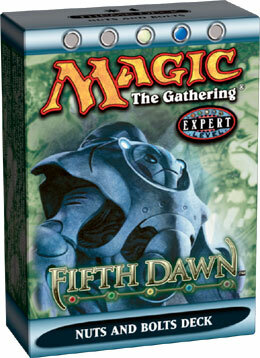 Skullclamp becomes illegal on the same day that the Fifth Dawn set becomes legal in those formats. Skullclamp will remain legal in other formats, including Extended, Type 1, Type 1.5, and all limited formats using Mirrodin Block cards. Events that begin on or before June 19, 2004—including U.S. Nationals and other multi-day National Championships that end on June 20 (Argentina, Brazil, Finland, and Iceland)—will not be affected by the ban. Skullclamp will be legal for the entirety of those events. Skullclamp will be banned in the Standard and Mirrodin Block Constructed formats on Magic Online on June 20, even though Fifth Dawn will not yet be legal for constructed play there. Skullclamp will remain legal in the other online formats, including Extended, Tribal Wars, Prismatic, Singleton, and Open. Look, for example, at the Top 8 decks from Ohio Valley Regionals. Or at those from the more recent German Nationals. Combined, those 16 decks contained 58 out of a possible 64 Skullclamps. Never in my memory have I ever seen a card show up in those numbers. We did not ban Skullclamp to “hurt Affinity decks,” as some players believe. We weren't out to kill one specific deck (and if we were, we would have chosen a different card), but rather to salvage the entire format. Some decks are just naturally going to be better than others, and if Affinity is one of the better decks, we're ok with that. What we're not ok with is having one card be the focal point of every viable strategy. The three “best decks” in Standard pre-banning—Ravager Affinity, Goblins, and Elf and Nail—can all do ridiculous things early in the game without Skullclamp. Affinity can play Disciple of the Vault, sacrifice everything to Arcbound Ravager, and Shrapnel Blast you to death by turn 4. Goblins can also kill on turn 4 easily with Goblin Piledriver, Goblin Warchief, and Siege-Gang Commander. Elf and Nail can play Tooth and Nail entwined on turn 4 with the help of Vine Trellis and Vernal Bloom. All three decks, should they survive into the newer metagame, will still be capable of such antics. Decks that can sometimes make plays like that are fun and exciting—the problem was that Skullclamp gave them all a resilience and a robustness that they had no right to have. Removal and board-sweepers should be able to dent their strategies, not just let them draw more cards! Note that the ideal Tooth and Nail plan makes no use of one-toughness creatures, yet the way to make the deck a winner was to add sixteen one-toughness creatures and four Skullclamps. We do not want that being the only viable plan for successful deck building for the next 16 months. In block, Skullclamp had become sort of a “black hole”—invisible, yet its tug so strong as to drag everything around it into a swirling vortex, at the center of which sits Arc-Slogger. The reason why the “big red” deck was the best option pre-banning was because it beat the tar out of Ravager Affinity. It sat atop the food chain—Red beat Affinity, which beat everything else. Now, hopefully, the “everything else” can come out of hiding and give the red deck the challenge it needs, opening up this stagnant one-deck metagame. The thing about this banning that I feel bad about is that the card in question was much more widely used and enjoyed than cards that have been banned in the past were. Very few people had fun with stuff like Mind over Matter and Memory Jar. But everyone can find a use for Skullclamp. Players at cardshops and kitchen tables around the world are slapping it on everything from Auriok Glaivemaster to Bottle Gnomes to Fallen Angels. And to them the card isn't “broken” or “environment-warping,” but rather only very good and quite fun. I'm sure the card is responsible for making many iffy Friday Night Magic decks into contenders—heck, even a Bird or Dwarf tribal deck can laugh off mass removal with some Skullclamps handy. Many people have complained on the boards that their “Black-Green Death Cloud Cemetery” or “White Weenie Equipment” decks were ruined by the banning. And to them I apologize. But the Dark Side will always use power for evil, and while I appreciate your desire to employ Skullclamp somewhat fairly, I still say the card is dumb and had to go. Somewhere—maybe not in your store, or in your town—someone else was using Skullclamp more efficiently and to more devastating effect than you were. I'm sure there were kids using Lotus Petal years ago to put out first-turn Warrior en-Kor, and they were left scratching their heads when the Petal was banned. And maybe, just maybe, a guy somewhere was sacrificing Black Lotuses to power out early War Mammoths, and wondered why in the heck Wizards felt the need to create a Restricted List. There will always be casualties in the crossfire, I suppose. I feel your pain. Hey, we all have our bad days. When equipped creature is put into the graveyard from play, draw two cards. Sacrifice equipped creature: Draw two cards. Equipped creature gets +1/+2. When equipped creature is put into the graveyard from play, draw two cards. Equipped creature gets +1/-1. When equipped creature is put into a graveyard, draw two cards. That's it in all its glory. That change was made with over a month to go before the set was to be typeset, and none of us ever batted an eyelash at that card. Often when cards are changed that will impact our constructed playtesting, a memo is sent out notifying everyone about the changes and urging people to try the new incarnations of the cards. No such memo ever went around regarding “Thought Extractor”—no one thought of it as necessary. By no means am I saying that Skullclamp's hidden power is an excuse for us missing it. We're paid professionals—we're supposed to find and fix stuff like that. But we were entrenched in our own internal metagame and this card slipped through the cracks. So How Did Gottlieb Know It Was Broken? We eventually figured out what we a monster we'd created during that dark period during when it was too late to change, but way before the set hit the streets. We knew there was going to be a train wreck, and all we could do was sit back and watch. Fifth Dawn was almost done being developed, and I was working on the “cog” theme deck (that would later be titled “Nuts and Bolts”). I did a search for 0- and 1-mana artifacts in the block for the deck and came up with, among other things, Skullclamp. I threw in one copy since I had several Trinket Mages and a Steelshaper's Gift to find it. As I played the deck, it quickly became apparent that Skullclamp was capable of doing powerful things—that's where the quote at the top of this article comes from. I pointed it out to a few people, and Matt Place made a deck using what everyone tried the first time they used Skullclamp—Elves, including Wirewood Hivemaster. The deck was cute and capable of drawing lots of cards, but it got smashed by Goblin Sharpshooter, and our control decks had enough juice to keep the Elves down. It was put away, and Fifth Dawn development wrapped up. So if you're wondering why we make cards like Trinket Mage, Steelshaper's Gift, Krark-Clan Ironworks, and Eternal Witness in the set following Skullclamp, it's because Skullclamp was a non-entity to us, even at that point. From there, it was going into everything—White Weenie, Ironworks combo, you name it. Our internal format quickly degenerated into Clamp vs. Anti-Clamp, and we were all very sad. 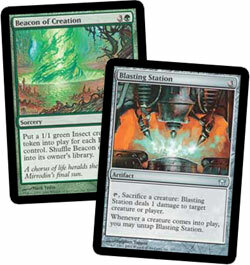 Most of what we thought was good work on the last couple sets was swept away by this nasty little 1-mana equipment. All this was happening at about the time Mirrodin debuted in the “real world.” We knew what the future held, and we were powerless to do anything about it. There were whispers internally even then about banning the card, but we all hoped that maybe the players would find a way around the problem and it would all work out ok.
Darksteel came out, and it didn't take long for players to uncover the Clamp's power. I distinctly remember Jarrod Bright on Brainburst deeming the card “broken” very early on, and Nick Eisel on Starcitygames saying, “Skullclamp is likely as big a mistake as Wild Mongrel, even if it isn't as obvious at first.” At this time were trying to implement fixes for the environment in Champions of Kamigawa development, but most of what we created seemed really forced, not quite good enough, or both. 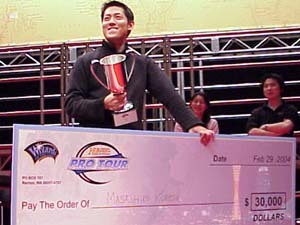 On top of that, we weren't even sure Skullclamp would survive in Standard until Champions was released, so we decided to sit on our hands and let the results from Pro Tour – Kobe and US Regionals tell us what to do. Maybe the players would solve the puzzle yet. The results from Kobe were weird, and oddly uplifting. There weren't some insane number of Skullclamps in the Top 8 decks, only eight total! We didn't immediately recognize what Skullclamp had done to make the format what it was, but it was pretty clear that we didn't need to ban anything on March 1. As Regionals crept nearer, we were kept hoping that some of these potential “answer decks” that we'd been hearing about—Mono-white with Damping Matrix, Tooth and Nail, Red-Green Beasts, etc.—would rise up and keep Skullclamp decks in check. But it just didn't happen that way. Three-quarters of the decks that qualified people for US Nationals that weekend had Skullclamps in them. Something had to be done. 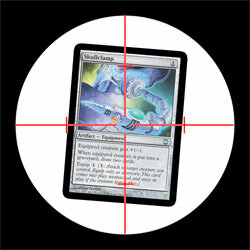 After much arguing, soul-searching, and gnashing of teeth, we decided to give Skullclamp the boot in both formats. By now these people know the truth, and I feel like we let them down. We didn't engineer this environment—heck, we didn't imagine Darksteel Standard to look anything like this. We didn't print fixes because we didn't know about the problem. And we're sorry that your faith in us—the whole development process—has been shaken. But don't despair. You shouldn't expect us to be perfect—it's not possible for us to be, and it would be really boring if we were. As Magic R&D Director Randy Buehler likes to say, “We're better off pushing cards than making another Homelands.” Part of the excitement of building decks with new cards should be the idea that R&D might have missed something, and you could be the one to rub our faces in it. We don't want people to have the false idea that we have every environment mapped out and solved and we're just watching from above, waiting to see if you all fall in line. It's not like that at all. We have a decent idea of what decks will be good, but we never get it exactly right. We didn't put Wonder in our madness decks, Astral Slide in our cycling decks, or Patriarch's Bidding in our Goblin decks. We never had a tier-1 Tooth and Nail deck or white Urzatron deck. We thought Wizards were a real deck, for crying out loud! And we obviously didn't put Skullclamp in our Affinity decks (until it was too late). The whole development process of a TCG only works if there are doors left open for players to exploit, and that's naturally going to be the case due to unavoidable human error. You outnumber us several million to under 20. We know we can't get away with any kinds of slip-ups… we try to stop them, but occasionally something goes wrong. I can't say we're ever happy to ban cards, but we're happy to toe the line, even if it comes back to haunt us later. We printed over 2500 individual new cards in between the Urza block (the last block to give us cards banned in Standard) and Skullclamp. That's a pretty good record. But who knows if the next card that deserves to be banned is another five years away, or right under your nose in Fifth Dawn? Hopefully you'll all enjoy the search. Until then, you'll have to find a new way to draw cards. Which set of names would you have preferred for the Stations?